The NSX and S2000 are great and all, but my all-time favorite Honda may just be the Honda City Turbo, because that was a turbocharged hot hatch with a freaking scooter in the back. Now Honda has revived the idea with a 2015 Fit and a the wonderful Grom mini-cycle, and I want them to shut up and take my money. Honda today unleashed a slew of 2015 Fit concepts for the SEMA show, and most of them are actually pretty cool. 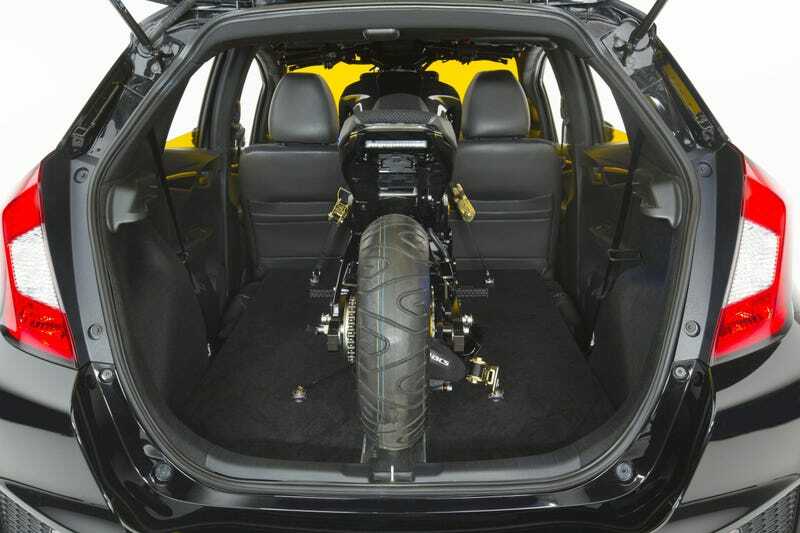 Far and away the best, however, is this black and yellow MAD Industries Fit, which comes with a matching Grom you can shove in the trunk. Just imagine: You're having a good time in your efficient, zippy, parkable Fit, and when you need to go somewhere a car can't go, you just unleash the Grom. You'd be unstoppable! You'd be a legend. All the fun in the universe would be yours to have. Other Fit concepts dropping at SEMA include their new B-Spec racer from Honda Performance Development, a turbocharged neon blue Fit from Bismoto, and another one tuned by Spoon Sports. Good stuff all around. Now, about that Grom that comes with the Fit — how much do you want, Honda?